Last night, the Insight Astronomy Photographer of the Year competition announced its winners. The results, as you might expect, are astronomical. Here are a few of our favorites. The image above, by Chap Him Wong from Hong Kong, won the People & Space category. 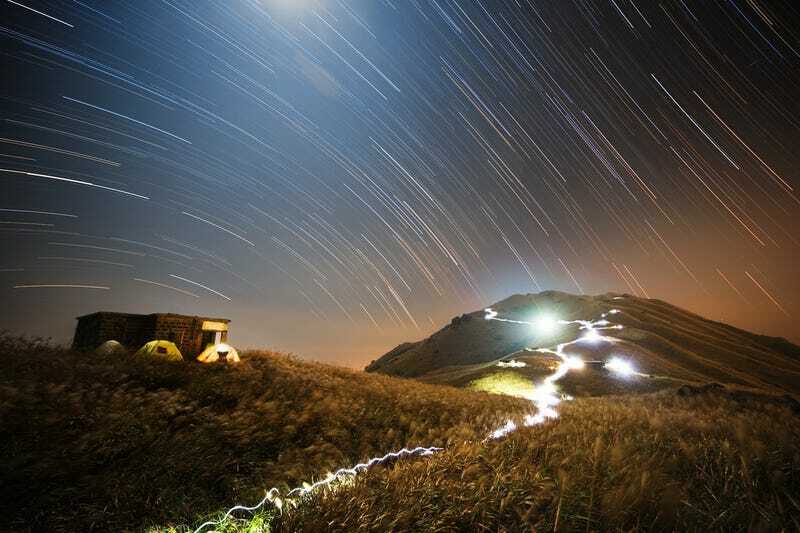 It depicts Sunset Peak, Hong Kong’s third-highest mountain, with star trails looming behind. The trails of light are from campers wandering along the paths during the long exposure. Meanwhile, below is a shot of Comet/2014 E2 Jacques in the path of the spectacular NGC 896 Nebula by Lefteris Velissaratos from Greece, which won the Planets, Comets & Asteroids category. The judges pointed out that this is “a tough picture to do well because the comet moves relative to the background nebula.” Regardless, it’s stunning. The image below in fact won the Young Person’s competition. The shot of Comet Lovejoy, captured by 15-year-old George Martin from the UK, reveals its “motion against the stars because the stars appear to trail behind it” — a result of the stacking process used to put the image together. Imagine being able to take photographs like that at the age of 15! Finally, this picture of the 2015 solar eclipse as seen from Svalbard, by Luc Jamet of France, won the Skyscapes category. It’s a particularly beautiful image — eerie, moody and majestic. You can see more images from the competition on the 2015 Insight Astronomy Photographer of the Year competition website, including categories for the Sun, Moon, Aurorae and more. It’s worth a look — they’re all terrific. All images are from the respective photographers and the Astronomy Photographer of the Year/National Maritime Museum.